ca 560 - 550 B.C. 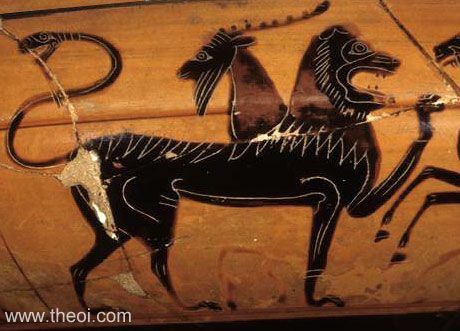 Side A: Detail of the Chimera from a scene depicting its battle with Bellerophon and the winged horse Pegasus. The monster has the head and body of a lion, the head and neck of a goat rising from its shoulders, and a coiling serpent for a tail. Side B: Pandareus and the Golden Hound (not shown). Tondo: Heracles and the centaur Nessos (not shown).